There is an unusually high rate of short sales and foreclosures in Killearn Acres, as 44% of the sales in 2012 were distressed property sales. The real estate graph on the right shows the accelerated pace of distressed property sales that has taken hold of Killearn Acres. 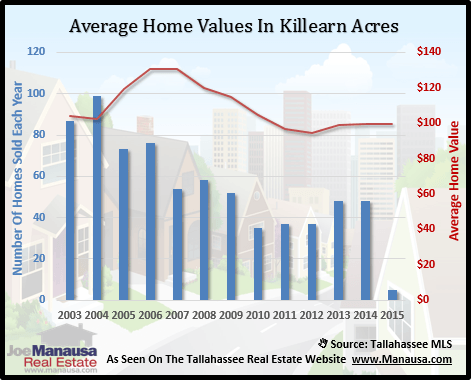 Currently, there are 14 homes for sale in Killearn Acres in the Tallahassee MLS, and distressed home sales are out of control. Soon, more than 1/2 of all Killearn Acres home sales will be a short sale, foreclosure, or bank owned property. Killearn Acres home values declined 2.3% in 2012, and the neighborhood did not enjoy the growth in sales that many others found. Could this be a sign that buyers still expect large declines in Killearn Acres in 2013? It is highly likely that we will see Killearn Acres home values decline in 2013, as distressed properties for sale are hotter here than in any other large neighborhood. We know there are plenty more to clear as well from the shadow inventory, only the pace at which they flow into the market will determine how fast the real estate recovery occurs. 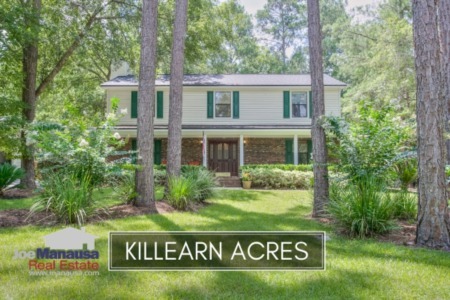 The following map shows all of the homes for sale in Killearn Acres. Simply hover over a marker and a picture of the home will appear, as well as limited information on the home. If you want to know more about the home, simply click on the picture and the entire detail page will be revealed. 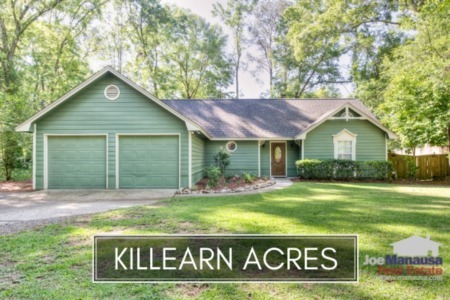 I hope you were able to learn something from this Killearn Acres Home Sales Report, please drop me a note if you have any other questions or concerns that I can help you with.